Tangled and True: all things bright & cheery. 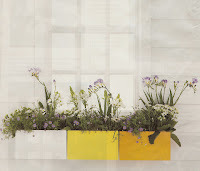 wouldn't THESE window boxes look darling on the front of any house? even better, they come in 13 different color & 8 different shapes. what fun it would be to mix and match! they would also be fun inside, perhaps in your office, or a play room? i have so many uses for them swirling around inside my head!